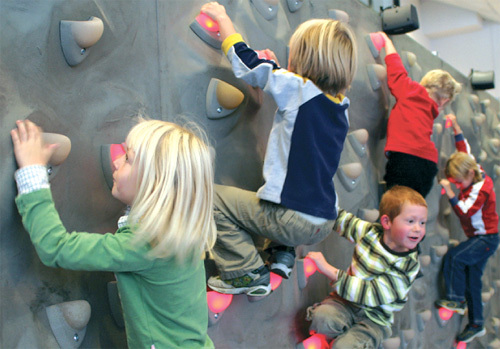 DigiWall Interactive Climbing Wall | OhGizmo! By Andrew Liszewski on 05/27/08 • Leave a comment! You can think of the DigiWall as a gigantic version of the WiiFit. But instead of doing physical activities like pushups or skiing, you actually climb it like any other indoor climbing wall. The grips are equipped with individual sensors for hands and feet that allow a computer system running in the background to track the movements of various climbers on the wall. And like with the WiiFit, the DigiWall is designed to make physical activities more entertaining by disguising them as interactive games. On the DigiWall these include ‘Catch the grip’ where you try to touch as many climbing grips as possible in one minute, or even a giant version of Pong where your whole body is used as a paddle as you compete with a player on the other side of the wall. The DigiWall doesn’t have a traditional video display like a computer monitor, but instead uses the light-up climbing grips to form a large but low-resolution monochrome display. It also relies on a seven channel speaker system for audio feedback, and can even be turned into a giant musical instrument if you wanted to let your creative juices flow. The DigiWall was originally developed at the Interactive Institute’s Sonic Studio in Sweden, but is now a real product that’s available for sale. It comes in 6 meter wide by 2.6 meter high sections that can be combined to create a larger wall, but if you want pricing info you’ll have to request a specific quote.